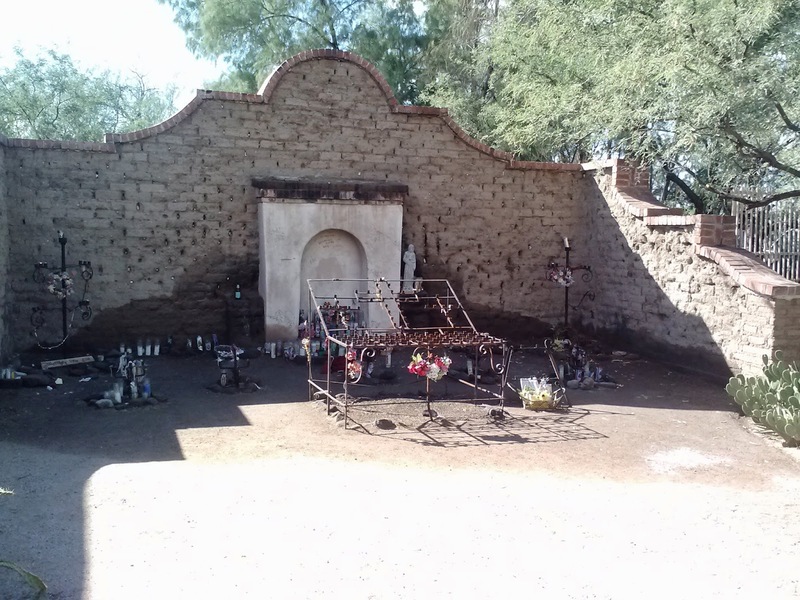 Brett Hendrickson, a Religious Studies scholar at Lafayette University, wrote the following piece for the blog Religion in the American West on the folk saint “El Tiradito” and his shrine in Tucson, Arizona. Hendrickson has studied and written about curanderismo and folk saints in depth. His book, Border Medicine: A Transcultural History of Mexican American Curanderismo, (link) is coming out at the end of 2014 from New York University Press. I met him at the University of New Mexico’s annual “Traditional Healing Without Borders” class two summers ago, and we have stayed in touch ever since. Last fall we participated in a panel on Religion and Healing in the Borderlands at the 2013 Western Historical Conference and we continue to share ideas and information about curanderismo in the U.S.-Mexico borderlands. Brett agreed to let me share this piece, originally posted on the Religion in the American West blog he regularly contributes to. On both sides of the international border with Mexico, devotions to so-called folk saints flourish. Some of the major figures include Jesús Malverde, the Niño Fidencio, and—of late (pun intended)—Santa Muerte. Often unorthodox, these figures once operated on the institutional edges of Catholicism, but nowadays, they often extend their power and care over devotees with multiple religious backgrounds and histories. Unlikely ever to gain official canonization, borderlands folk saints nevertheless remain the focus of a great deal of material religious activity. …these ánimas or folk saints, whatever they should be called, produce results. Many people pray to them or go to séances in which they are channeled because they have “come through” for friends or relatives…. [Folk saints] seem to supply hope if not help to many who stand in most need of those commodities (152). 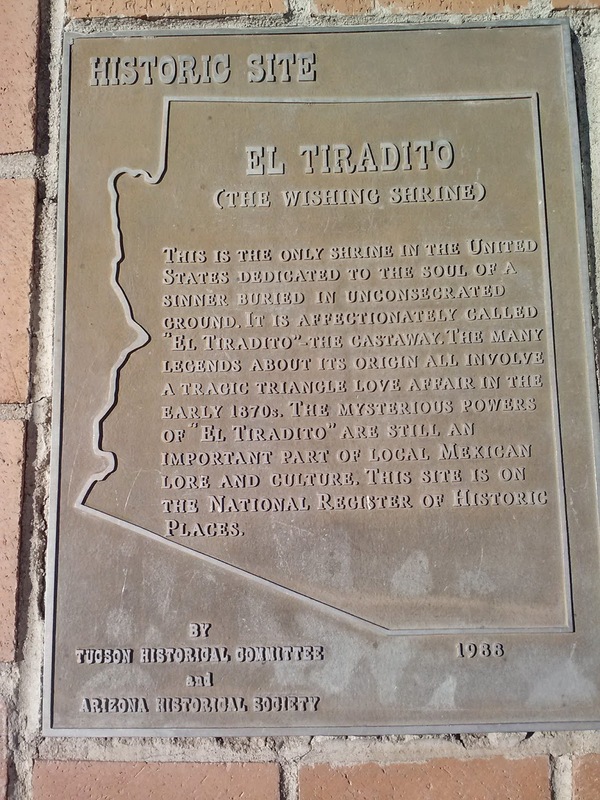 One of the less well-known of these folk saints is El Tiradito, “the little one who was thrown away” in Tucson, Arizona. His current shrine has been operational since the 1920s, but the devotion to him is older than that. Accounts vary as to El Tiradito’s origin, but many mention a man who was killed fighting over a woman he loved. Last fall, when I attended the Western History Association in Tucson, I made my way to the shrine to explore this living example of folk devotion and negotiation between heaven and earth. 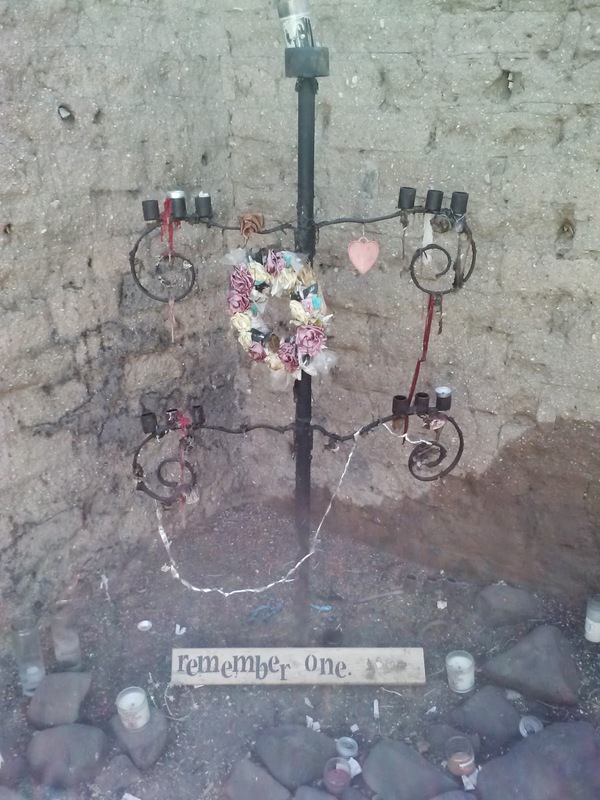 The shrine itself resembles an open-air adobe side chapel, replete with candle stands and other evidence of use. 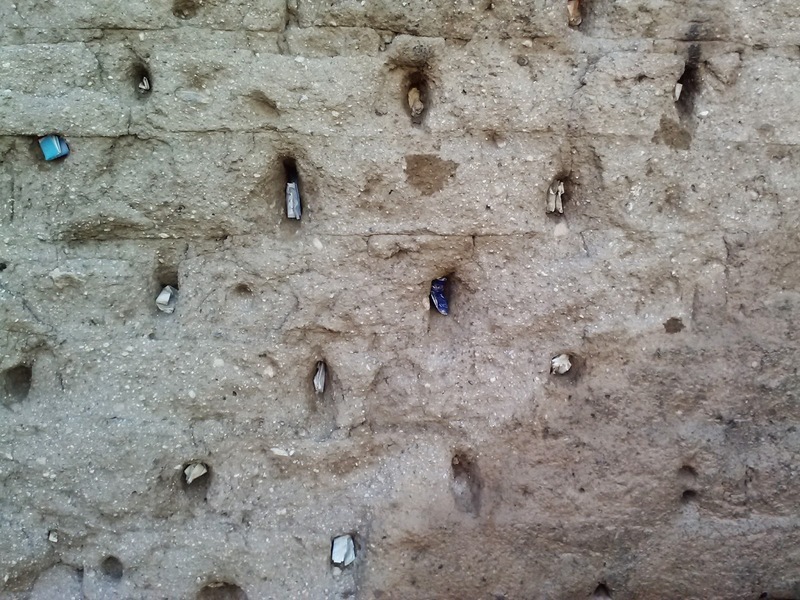 The back wall of El Tiradito functions like Jerusalem’s Wailing Wall in that petitioners insert their prayers and desires on little pieces of paper into crevices. 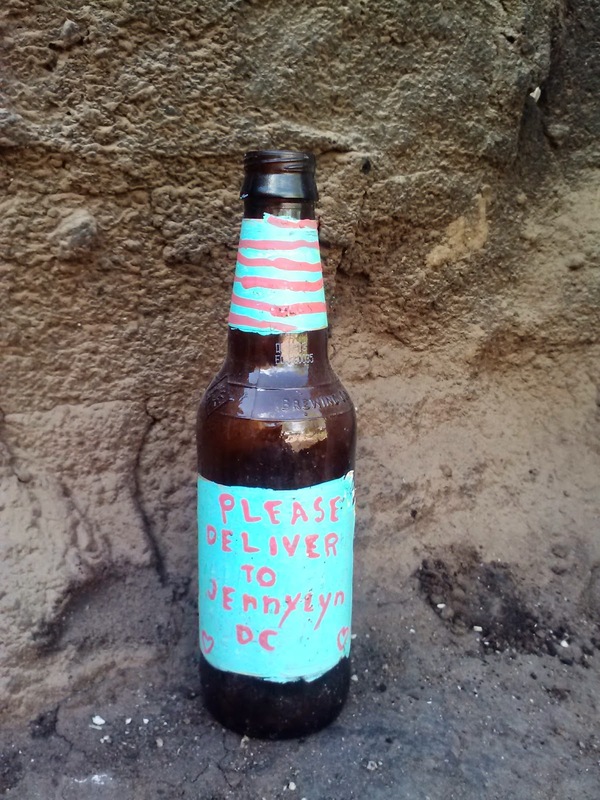 Another visitor had left something for a specific individual, hoping that “a message in a bottle” might do the trick. Perhaps the most fascinating part of my visit to El Tiradito had to do with one unique group of objects. 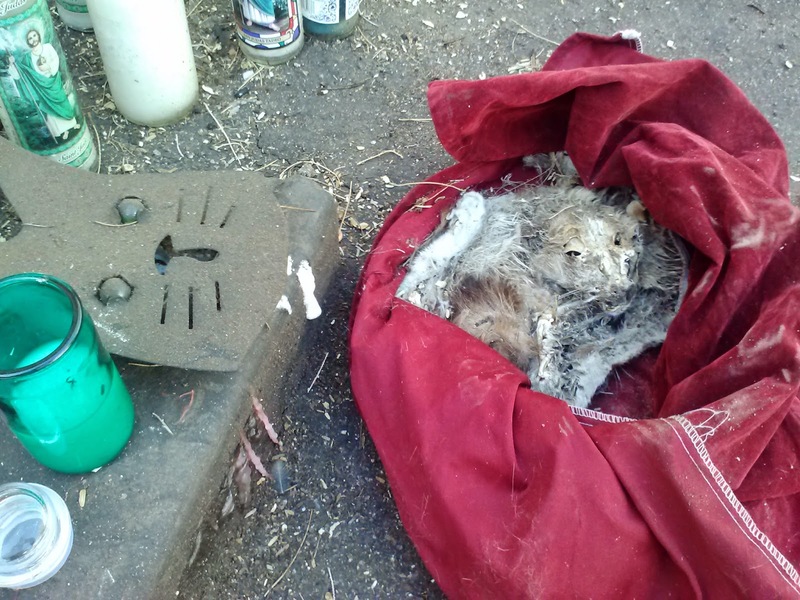 Near the base of the candles, someone had a left a metal sculpture of a cat’s face. At first I thought this must be the whimsical offering of an artistic cat lover. But then I noticed a red velvet bag near the metal cat. Nudging it open with my foot, I was startled by the mummified remains of a cat. I can only speculate that after someone’s beloved pet died, it was left for El Tiradito as a final act of devotion to both the saint and the kitty. Like Griffith, I would suggest that special petitions can happen at the shrines of folk saints because the saints themselves in their lives knew the messy passions of love, grief, and longing. 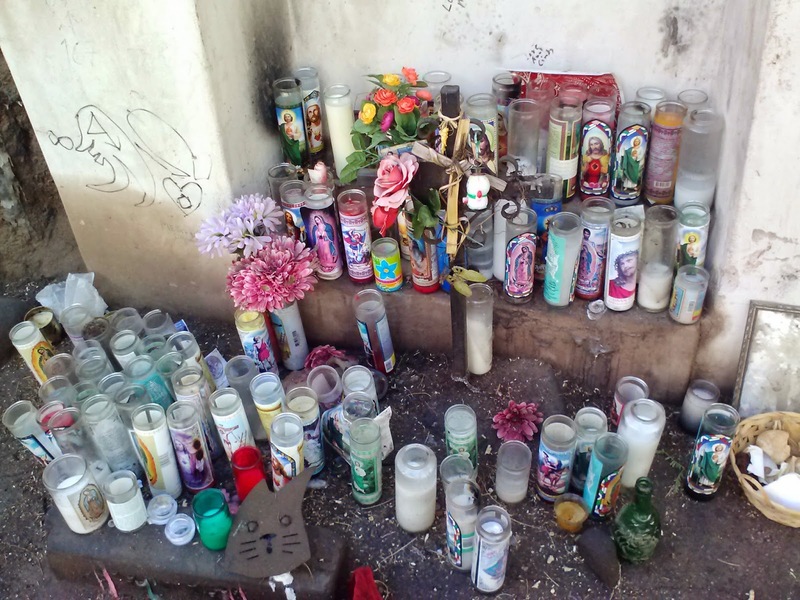 As long as these passions persist, places like El Tiradito shrine will thrive as sites of transaction and catharsis.